Hi! I've noticed that my son's heels tilt inward when he's not standing. So, when he stands, it forces his heels and ankles to flatten and be straight, or level to the ground. He has had severe pain behind his ankle at the skinny part where the achilles tendon can be pinched. Doctors called it Sever's. Sometimes this pain radiates up his tendon 3-4 inches toward the calf. In the beginning of this condition, he had acute pain on the interior corner of his heel. I've noticed that when I try to turn his heel out flat, it's the inside ankle area where the pulling is, almost like his feet are growing turning inward at the heel/ankle connection. This appears to be where this unnatural stretching is occurring and the origination of his pain. When I try to turn his heels out flat while he's lying down, he feels the painful pull going from his inside heel up through the inside of the achilles tendon. The ankle/heel connection appears to not want to be straightened, and I really have to pull on the heel to get it to straight, like the ankle bone won't let it straighten any further, like its grown turned in. He falls periodically because his ankles turn in while walking. Two ortho doctors and 2 periods of physical therapy later, and custom orthotics, and he has no relief, only worsening. They keep telling us to stretch the achilles tendon, but the problem appears to have something to do with the ankle bone and heel tilting in that is straining these ligaments and tendons every time he walks. Is there a birth defect or condition they are missing? 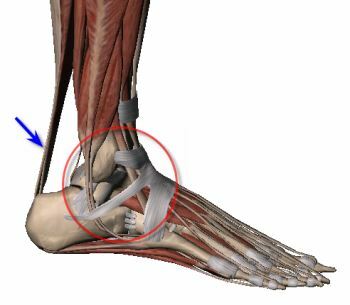 They say pronation, but the heel can't be straightened without alot of pressure and it feels like the ankle bone is in the way. We have exhausted our solutions with regular doctors. It seems the ankle and heel turning in is putting stress inside the entire ankle-foot connection. It's been over 3 years, and he can barely walk, especially after stretching or some walking. Is stretching all we can do? My son's feet get terribly worse when stretching is attempted. Also, he is growing so fast- went through 2 whole shoe sizes in a little over a year. He's 99th percentile in height now for his age of 13. Please help! In spite of your extensive narrative I am confused as to what exactly is going on, but in spite of that I will attempt to try and sort things out as best I can. Sever's disease is a condition that generally causes pain in the heel bone itself as it is an inflammation of the growth plate within the heel bone. This inflammation can be brought about by a tight Achilles tendon, but as stated the pain will usually be in the heel and not the Achilles tendon. Sever's disease is a self limiting condition that will eventually resolve itself. I am not sure how much of a possible Sever's disease is part of this equation. your son's problem is a very tight Achilles tendon, which is exacerbated by his accelerated growth rate. What happens in some kids is that their skeletal system grows quicker then their muscular system. So in your son's case, the Achilles tendons are actually getting tighter because of his quick growth rate. As they get tighter, they become more painful. Stretching and physical therapy, in my opinion has a real limitation, as you can only stretch the Achilles tendon so far, and physical therapy will attempt to further stretch the tendon and perhaps offer some treatment in reducing pain, but most of the benefit will be negated as soon as your son attempts to walk. It is important to note here that one of the ways the foot compensates for a tight heel cord, is for the foot to pronate. Pronation is the movement of the heel in an outward position, the exact opposite position his foot is in when he is at rest (according to you). As you further describe when he stands, his feet lay flat to the ground. Believe it or not, that is the position you would like his feet to be in, but since he has tight heel cords, it sounds like that is not enough motion in the heel and he needs to be more pronated. So, that raises the issues of a potential bone block in the rearfoot, represented by the red circle in the enclosed diagram. This is known as a tarsal coalition, you can read the article on this site. Has your son been checked for that possibility? Sometimes it is evident on a simple x-ray, other times an MRI or CT scan might be necessary. A bone block in the foot will prevent motion in the rear of the foot and that could be part of the problem. Since your son has so much pain and is not getting better, a bone block should at least be ruled out. It may turn out that he has nothing more then tight Achilles tendons, but the dilemma here is that no one would consider doing an Achilles tendon lengthening until he is finished growing, simply because his muscles may end up catching up with the growth in his skeletal system and if so, his pain should resolve. My recommendation at this point would be to make sure he does not have a tarsal coalition if it has not already been done. Assuming he does not, then the next thing I would look at would be his orthotics. In general, most kids end up with hard plastic orthotics, but if your son's feet have some degree of limitation of motion then this type of orthotic will actually make matters worse. He more then likely would do better with a softer cushioned appliance that has a heel lift component to it. The heel lift will take much of the strain off of the tendon and hopefully make him feel better. That is about the best I can do without ever having examined your son, but hopefully it gives you an additional direction to explore.